Nathan Freke has been one of the fastest British GT4 drivers this season, and since the opening round, has rarely been far away from the podium finishing positions. 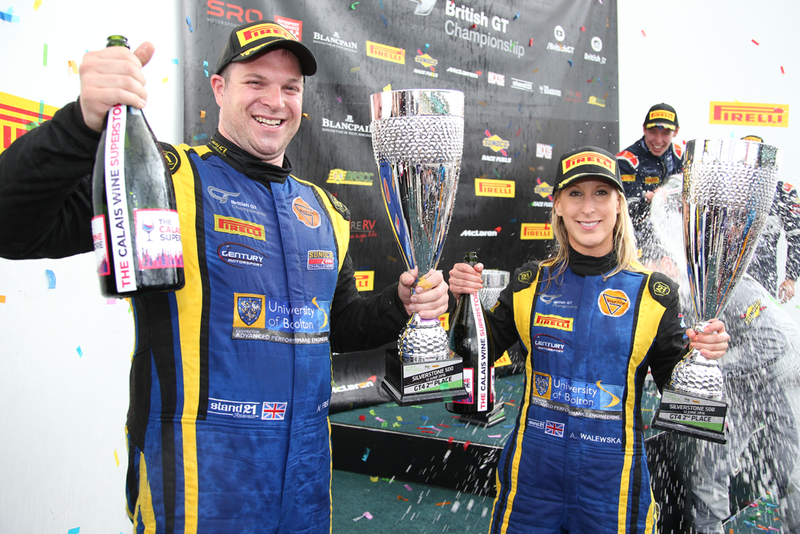 Having just missed out on securing their second official podium of the season at Oulton Park, Freke was keen to add a trophy from the championship’s biggest race of the year to his trophy cabinet. Knowing that the Ginetta would struggle compared to some of their high-powered rivals, Freke and his Century Motorsport team focused on their race pace, particularly given the knowledge that rain clouds were forecast to mix up Sunday’s race. Working through a number of setup adjustments during the day on Saturday, Nathan and teammate Anna Walewska were happy to place their University of Bolton Ginetta ninth on the grid amongst the British GT4 runners, safe in the knowledge they had a master plan for the race. On Sunday morning, the rain had arrived from the early morning, soaking the British Grand Prix host venue. With standing water now on parts of the track, the race was started under the Safety Car for the opening two laps, in an effort to launch the 51-car field safely into racing. With three mandatory two minute fifty second pitstops required as per the GT4 regulations for the event, the Century pitwall were hoping that the wet conditions, would allow some Safety Car pitstops to soften the blow. With the race starting under the Safety Car, initially the team was going to box the starting Walewska, but opted to cancel as the race went green one lap earlier than anticipated. After 35 minutes on track, Walewska finally pitted to hand the Westons backed Ginetta over to Nathan Freke for his first racing laps. However shortly into his stint, the Safety Car was now back on track, and the pitwall strategists brought Freke into the pits again, placing Walewska back in the car for her second stint. When racing resumed just past the one-hour mark, Anna put in a very solid run as the track was now starting to dry out. Doing her best to remain on track as long as she could, she was eventually called into the pits just before the two-hour mark, as the team felt the track was now ready for slick racing tyres. A fired up Freke returned to the track ready for an action packed ride over final hour of the race. Now in contention for a podium based on those in front still needing to make their third mandatory pitstop, Freke was also lapping quicker than those in front, and closing in rapidly. By lap 58 of the final 69, Nathan had climbed up to third in GT4, and two laps later would be promoted to second as the Fox Motorsport Ginetta dived into the pits for their final stop. Controlling his position to the end, Freke crossed the line to huge cheers from his Century Motorsport team to secure their second official podium of the season in what had been an action packed and dramatic race. Spa-Francorchamps – Belgium, Friday 8th & Saturday 9th July 2016.